We’re on Board with BGM! What is the BGM Business Partner Program? It’s an incentive program that recognizes businesses and organizations that support the future sustainability and growth of the Greater Binghamton Airport with a travel policy that considers a commitment to fly BGM. Why do we need this Business Partner Program? The competition for air service at regional airports like BGM has become extremely challenging. Pilot shortages, aircraft retirements, airline mergers, and low cost carriers at other airports have strained our ability to maintain a strong market to meet air service needs. How will the BGM Business Partner Program help? The Greater Binghamton area has the passenger demand to support more service, but needs individuals and businesses to recognize and use this valuable resource. As more passengers choose to fly BGM our ability to attract and maintain additional flight options and destinations increases. Reevaluating your travel decisions is essential to the success of BGM. What will our Business Partners Receive? Our BGM Business Partners will be recognized through the BGM Airport’s and Chamber’s website and social media outlets. Each partner will be highlighted with a photo of your team, the Chamber President, and Airport Commissioner at your organization’s facility, and also celebrated in our community for the support of the Greater Binghamton Airport. We have recently experienced, firsthand, the impact the highly competitive aviation industry can have on a community. 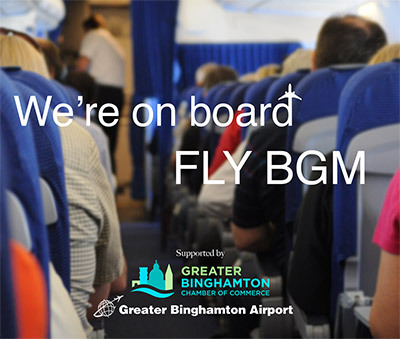 As a business owner, manager, or organization leader in the Greater Binghamton area, BGM is your home base for air travel. We have reached a critical point where it is imperative that local pacesetters, such as yourself, have the opportunity to lead the way and drive support of our airport. The commitment that you show to recognize BGM as an important economic asset will ensure that it remains viable resource to the community.